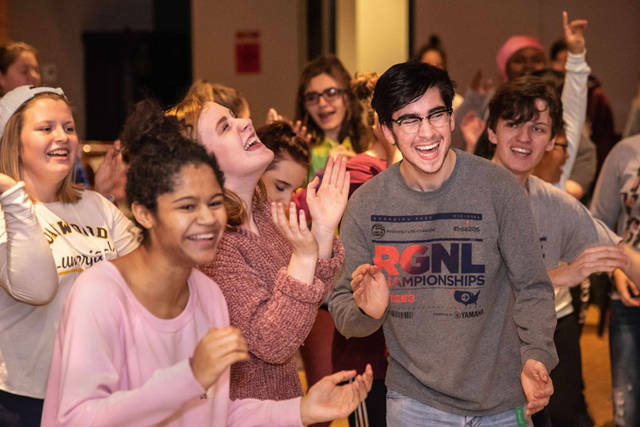 Students from 50 local schools have been rehearsing for the production of “Mamma Mia!” that will be performed Jan. 10 through Jan. 13, 2019 at the Victoria Theatre. 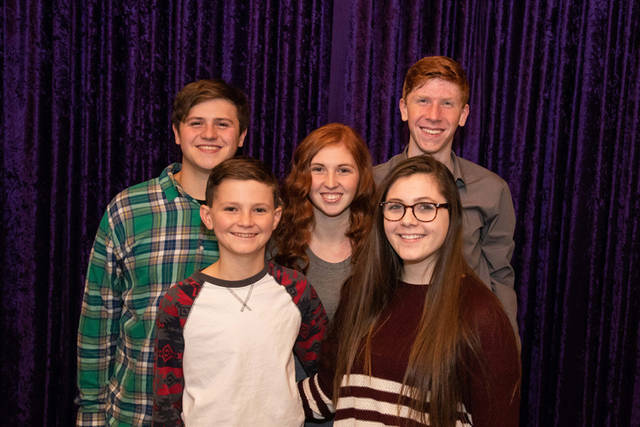 In the cast, crew and orchestra of “Mamma Mia!” are (front row, l-r) Collin Rismiller, Isabel Rawlins, (back row, l-r) Ben Harshbarger, Megan Rismiller and Matt Cromwell of Versailles. DAYTON – The hit musical unfolds on a Greek island paradise. A mother and daughter’s world turns upside down on the eve of a wedding in this tale of love, laughter and friendship woven around the story-telling magic of ABBA’s timeless songs. More than 60 million people around the globe have fallen in love with the characters, story and music that make “Mamma Mia!” the ultimate feel-good show. Highlights from the ABBA songbook include “Dancing Queen,” “Take A Chance On Me,” “SOS” and many others. Students from 50 local schools have been rehearsing for the production since mid-October, along with numerous parent and community volunteers. Amongst the rising young stars in the cast, crew and orchestra of “Mamma Mia!” are Matt Cromwell, Ben Harshbarger, Max McKibben, Isabel Rawlins and Collin Rismiller of Versailles. Approximately 140 singers, dancers, musicians and crew members will comprise this production and receive pre-professional training from internationally-experienced artists, including director Joe Deer, choreographer Lula Elzy and music director Sean Flowers, Producer Douglas Merk said. Tickets range from $15 to $59 and are on sale exclusively through Ticket Center Stage: 937-228-3630 or www.ticketcenterstage.com. Seats for the Muse musicals often sell out. Muse Machine is a nationally recognized arts education organization, providing creative experiences and resources for young people of the Miami Valley for the past 36 years. Since 1982, it has engaged thousands of students through academic-relevant lessons, workshops and in-school projects along with the highly acclaimed annual student musicals and concerts produced for the Miami Valley. For more information, visit www.musemachine.com.